You know you’re an adult when… you get excited about laundry appliances. We have been facing some unusual challenges in regards to doing our laundry. I recently acquired a Spindel and decided I just had to tell you about our challenges and how the Spindel has transformed my weekends. Herewith our Spindel review. We have a limited supply of electricity which greatly restricts our power usage. We have been allocated only enough power to run a couple of power tools or boil the tea-time kettle while the house is being built. Therefore, we have to be very careful about what appliances we run and when, otherwise we run the risk of tripping the system – something we’ve done several times. Working in Cape Town during the week means we only have the weekends in which to wash our clothes. We only had two available options in regards to laundry, and that is; Laundromat or wash by hand. We decided to split the washing up into two batches. All of the dirty work clothes (full of tiny metal fragments and grease – impossible to wash by hand) along with the towels and sheets go to a Laundromat, and the lighter clothing and things we need every week such as socks and my staff uniform, we wash by hand. The biggest problem I’ve faced in regards to laundry these last few months has been in getting it dry. It has been a wet winter, which we have been very happy about. However, the wet weather makes it exceptionally difficult to get our laundry dry and ready to wear by Monday. Wringing out laundry by hand is hard work even if you are built like the Hulk. It’s very difficult getting the water out using this method. Also, you don’t want to wring it too much as this will damage the fibers and reduce the life of your clothes. Before the weekend, I usually check the weather report and see which day will be hotter and better for laundry. However, we have had a weekend or two where it rained the entire weekend. We didn’t have any choice but to let our laundry hang on a clothes-horse and drip onto a towel on the floor. One particularly bad weekend we washed our clothes first thing on Saturday, and the clothes were still damp on Wednesday, despite us hanging them up in front of the gas heater as close as we dared. An average weekend, with sunshine, will have us hanging the thicker items of laundry, such as winter socks and jackets, out in the sun for both Saturday and Sunday before they are dry. As a result of all of this, I have become quite compulsive about checking the weather and spend my weekends stressing about the drying times of socks. But we found a solution! 4.5kg or 6.5kg Load Capacity: We have the bigger of the two units which can fit four king size sheets at a time. This is the perfect size for my load of hand washing. Ideal for any machine or hand-washed laundry: This is excellent because even if we had the power supply to run a standard tumble dryer, we wouldn’t be able to use it for our hand-wrung clothes as they would still be too wet after wringing out. 2800rpm – double the spin power of most washing machines: This is how it gets so much extra water out of your laundry. For example, if you use a washing machine with a spin cycle of 800rpm to wash three large towels, the Spindel will be able to remove an additional litre (!) of water from the towels that your washing machine was unable to remove (1200rpm = 350ml). And not only that – it only takes three to five minutes, which I think is pretty astounding. Highly energy efficient: When Kevin read on the box that the Spindel uses 300w of power, he burst out laughing from the surprise. I asked him to explain 300w in a way that I could understand. Three or four filament type lightbulbs will use 300w of power. Therefore, using the Spindel for five minutes, will be the same as having four lights on for five minutes. In comparison, your electric kettle uses about 1500w. Running a standard tumble-drier for an hour is like boiling your kettle continuously for an hour. Ouch! I vote Spindel! Air dry laundry faster or run a much shorter cycle in the tumble dryer: Yeah! The laundry won’t be totally dry after a session in the Spindel but this is good as it helps prevent creases and that last bit of moisture will quickly air dry. It’s so close to dry. And if you do want to use your tumble dryer to get out the last bit of water, you’ll be saving a lot of power because your cycle will be so much shorter. Removes residual detergents from laundry: This is a huge bonus feature for us because we do have some skin sensitivities in our family and have to take care as to what detergent we use as it is. Surprisingly quiet: Have you ever had to listen to a tumble dryer for an extended period of time? Did it have a squeaky bearing that needed oiling? It’s pure torture. The Spindel was surprisingly quiet and barely even moved once it was up to speed making it difficult to even tell that it was on (except for the water pouring out the spout). Safe for delicate items: Anything can go into the Spindel including more delicate fabrics. This is not something that applies too much to us as we tend to buy harder wearing clothes due to the work that we do. However, it’s good to know should the need arise. Lightweight: The bigger of the two units only weighs 8.7kg. This means that we can store it in a corner and easily move it when we need to use it. It must have been quite a funny sight to see us on the day we opened up the box containing the Spindel. We decided to run it in the shower as the water would be able to run directly down the drain. Louis, Kevin, Gwen and myself all crowded into our small bathroom to watch a machine magically remove water from clothes. It was pretty amazing watching the steady stream of water pour out the spout for a couple of minutes before dwindling away. It was really bizarre hanging up “almost dry” laundry after battling for weeks with sopping wet laundry. On this particular day we only got around to doing the laundry at about midday. Everything was dry (including those thick winter socks) and packed away by 5pm leaving my Sunday laundry-stress free. If not cared for properly, tumble dryers can be a fire hazard as the accumulating lint can overheat and combust. This cannot happen with the Spindel. The tumble dryer is the UK’s second biggest cause of house fires, with approximately one fire caused by a tumble dryer every day of the year. Do I recommend the Spindel? Yes I do! I stumbled upon this contraption recently and was wondering whether I should get one. It sounds especially amazing and definitely more reasons to get me one now! What an amazing appliance! 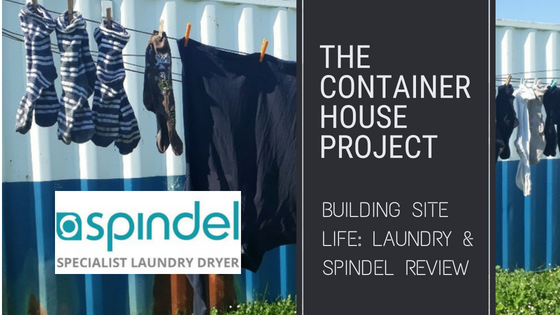 Your last few months in your home-under-construction have been a bit like the lives of the pioneers, setting up civilisation where previously there was none, but this Spindel contraption has dragged you right back into the 21st century! And I love that laundry cat! Hilarious!